Ishwari is the Fashion Tech Project Manager at Centre for Fashion Enterprise (CFE), London’s pioneering fashion business incubator. CFE has been an integral part of London College of Fashion since 2003, supporting emerging design talent and innovative businesses in fashion, jewellery and fashion tech. 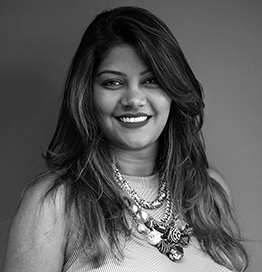 Ishwari currently manages all of CFE’s fashion tech projects – from designing bespoke support programmes and mentoring project beneficiaries to curating events to build a thriving fashion tech community in London. In the last 4 years, she has mentored and advised over 25 fashion tech businesses across UK, Europe and the USA, and hosted more than 10 fashion tech meetups. Ishwari is also a published research author, frequent conference speaker, experienced panel moderator and was named one of the ‘25 Forward Thinkers Defining the Future of Fashion’ in 2017 by FashNerd. She was also interviewed by Vogue Germany on AI and Robotics in fashion and Women of Wearables on the future of fashion tech.